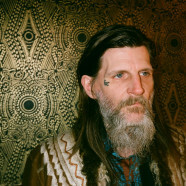 “I guess what ties this all together—all my musical projects and my life in general—is the idea of the quest, that search for new horizons and something unnamable and possibly unreachable,” Dylan Carlson says regarding the theme behind his solo album Conquistador. Carlson’s musical explorations can be traced back to his pioneering work with the minimalist ensemble Earth—from the groundbreaking drone metal of Earth 2 to the ominous instrumental twang of Hex; Or Printing in the Infernal Method. Untethered from the collaborative nature of the band, Carlson veered away from American music and motifs and dug into English folklore and song traditions for his solo work under the moniker of drcarlsonalbion. For his first full-length as the solo artist Dylan Carlson, the guitarist returns west. Conquistador was recorded at God City Studios with Kurt Ballou during a week long break in Carlson’s solo tour of the East Coast of the US in May 2016. The material had been gestating for several months, and Carlson viewed the session as an opportunity to create music between Earth albums as well as a chance to collaborate with esteemed solo artist Emma Ruth Rundle, who contributed baritone and slide guitar, and his wife Holly Carlson, who contributed percussion and whose picture graces the cover of the album. “I view every studio experience as unique, as everything is always different, from gear to people to time and place,” Carlson says of the recording process. “I have to say I got some of my favorite guitar ’tones’ on this album, especially on ’Reaching the Gulf.’” And indeed, anyone that’s basked in the discographies of Earth and drcarlsonalbion will undoubtedly be enamored with the lush sepia-toned vistas of Conquistador.